It is found in liquid, gas and even solid forms. The term hydrocarbon refers to the two main elements in petroleum – hydrogen atoms joined to a carbon atom. 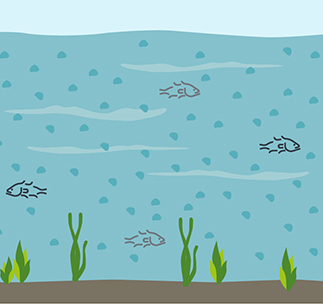 Petroleum originates from plants or marine microorganisms, like algae and plankton which lived hundreds of millions of years ago. If trapped and buried in sedimentary rock, over time a combination of the heat and pressure below the earth surface sees this organic matter transformed into oil, or in hotter conditions, natural gas. 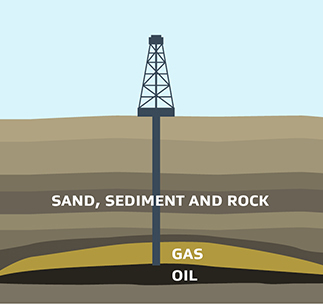 The resulting oil and/or gas then moves through holes rock until it is either trapped in a reservoir, or reaches the surface. Drilling a well into these reservoirs allows any oil and gas to be extracted. 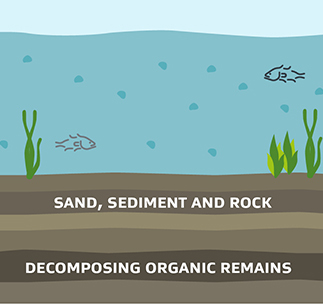 Small marine organisms and plants die and are buried under layers of sedimentary rock. Immense heat and pressure transform the organic material into oil and gas over millions of years. Operators drill through the rock and sediment to discover viable petroleum accumulations.